I did it. All clean and ready for 2004. In the process I realized that I have a lot of Cascade 220 odds and ends. Perhaps something stripey is in my future. 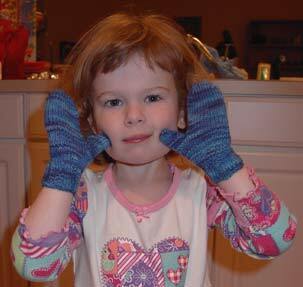 Speaking of 2004, I do have a few knitting goals/projects in mind. First of all I need to finish Pete's sock. Then I want to finish Maddie's Setesdal Cardie. 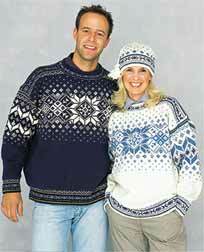 I need to do this before I start Pete's Besseggen sweater. 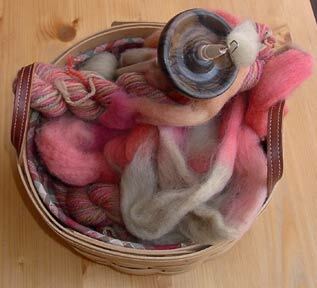 And speaking of Besseggen, the Bea Ellis Newsletter alerted me to the fact that Heilo is their yarn of the month for January. I have been waiting patiently for it to go on sale so I could buy the yarn for Besseggen. Only $3.75 a skein! What a deal! Other than that, I guess I'll see where the knitting goddesses take me. And this seems like an appropriate time to say "THANK YOU!!" to all of you who have enjoyed my Booga Bag pattern enough to purchase items through my Amazon Link. I think I've earned about $43 this quarter which will buy me a few knitting books. Can't beat that! Thanks again! And speaking of books. . . I'm a voracious reader and I'm always saying that I should keep a list of the books that I have read somewhere. So I have started a reading blog called Booga J Reads. I am really going to try to keep this updated. Perhaps that could be my New Year's Resolution! Happy New Year!! Hope you all have a wonderful 2004! 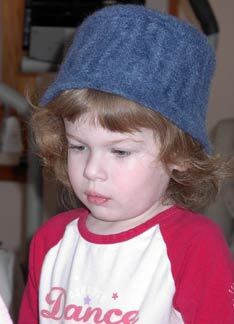 I made the felted version of Bonne Marie's Bucket-o-Chic for Maddie and it was super quick to knit. Luckily Maddie has a bucket that she likes to wear on her head like a hat (don't ask me! ), so it was the perfect size for blocking this hat. The variation in the Arucania Nature Wool gave a nice animal-ish print look to the hat. I got lots of goodies for Christmas, but nothing else of a fibery nature so I won't bore you with the details. And I have been working on Pete's socks. I am so embarassed. I started these in March (actually re-started them -- I'm not sure when I actually started them the first time). 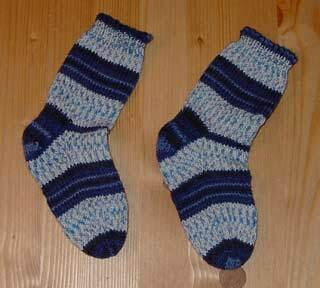 How could it take me this long to finish a pair of socks? I have no excuses. They have now been put on high priority. While I'm showing you my knitting shame, here is the mess that I will be cleaning up today. Usually when I start a project I get out a basket for it and put all the essentials inside. 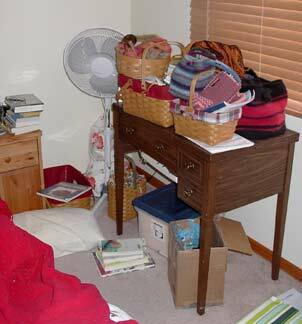 The plan is to clean the baskets out when the projects are completed. I have been a little lax in this area. 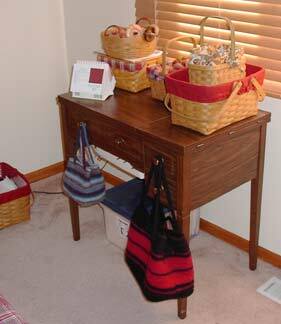 The basket sitting on the floor used to house Charlotte which I finished up in September for goodness sake! Time for a clean start (you know, New Year's approaching and all). At least my WIP's aren't too out of control, for a change. I was hoping that if I posted this picture, it would encourage me to clean up this mess and post an after photo tomorrow. We shall see. . . I joined the GSRP and I'm in the fair isle group. Can't wait to meet you other fair islers! I have so much more to say, but work and the holidays have kept me away. I hope to post tomorrow! This inspired me to cast on Pete's second sock. It's done in Lorna's Laces Shepherd Sport in Forest. 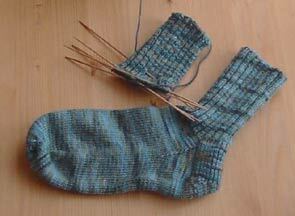 They are done on US 1's and the first sock was slow going, so it took me a while to want to start the second one. Not to mention that he really wants a thick pair of wool socks and the Lorna's doesn't really fit the bill. 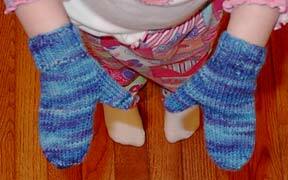 Can anyone suggest a thick, soft *sturdy* yarn for socks? I've been busy finishing up this and that. Here is my flower washcloth. It was quick and easy and I think it would make a nice last minute gift if you need one. All the details are in the gallery. This just goes to show that great minds think alike! Theresa made one of these on the same day that I did and we didn't even know it! Must have been a flower washcloth kind of day. He he! I also finished up a Madeleine Bag (pattern available through ThreadBear) in Kureyon that I have had sitting around for a while. The Kureyon didn't felt enough for my taste the first time around to I threw it in the wash again and I think it came out pretty cute! It only took one skein of Kureyon, so it was another quick little project. Here's a view from the back where you can see more of the color changes. Fancy, our kitten, had to get into the act. Isn't she a pretty kitty? And finally here is our niece's Christmas gift. I told you I was on a finishing frenzy! It is a Booga Bag -- what else! I really love this color of Kureyon. It's #126 and the stripes in it seem thinner to me than other colors of Kureyon I have used. Makes for very interesting handles because they are quite multi-colored. I think the next bag I design in Kureyon will be knit in this colorway. Speaking of bag designs. 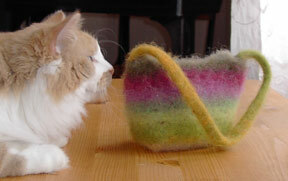 I am working on a felted fair-isle type bag using Kureyon and Cascade 220. 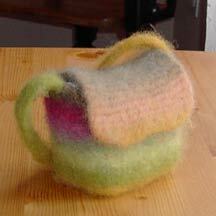 I have already knit up the first sample and felted it. I just need to sew in the zipper (yes -- I'm tackling a zipper!) and tidy it up. Pictures soon! Yesterday Pete, Maddie & I went to Marshall Field's on State Street in Chicago to eat lunch in the Walnut Room by the huge Christmas tree. The tree is especially gorgeous this year as it is decorated in Waterford crystal. Just beautiful! Maddie also got to sit on Santa's lap. She was quite brave! No tears at all and she smiled nicely for the (incredibly pricey) picture. I also finished up a sample of a new bag that I'm designing. 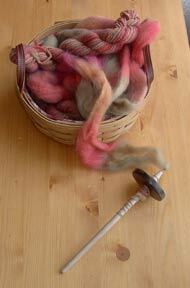 It went into the wash this morning, along with the Booga Bag for my niece and a Madeleine Bag made out of Kureyon. It's a felting & finishing frenzy! Of course this meant that I had to start something new. 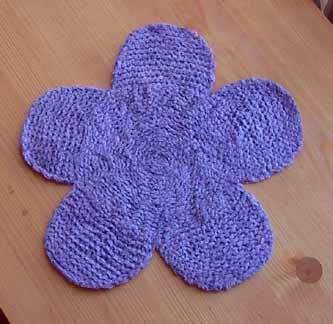 So, I knit the first two petals for the flower washcloth. I don't really *love* knitting with the cotton chenille, but I'm not minding it much either. It also helps that this is a small project and I know I'm not stuck knitting with the cotton for very long. In fact, I think that I'll be able to finish this cute little washcloth today. I'm on a roll! I have found a little time to knit. 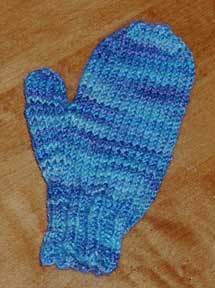 I usually knit for a couple hours before going to sleep. It relaxes me and I seem to have nice fiber dreams some nights! In fact, the bags that I design usually come to me in the middle of the night -- isn't that strange? 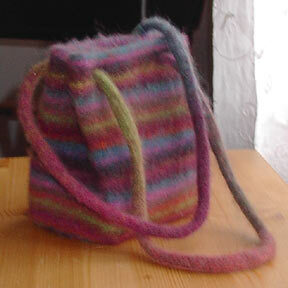 But most of my knitting time has been spent on knitting a Booga Bag for our funky niece Beth. She is a very hip young college student and I think this colorway will be great for her. It is Noro Kureyon in color 126 and I love the narrow stripes. I hope Beth likes it too! 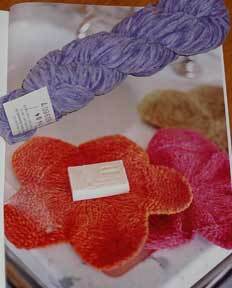 And that is a skein of Crystal Palace Cotton Chenille too! I couldn't resist the cute Flower Washcloths in the latest Interweave Knits. Maddie loves this yarn and keeps carrying it around, so I think I will be knitting this for her. I hope I like knitting with this yarn because it really is soft and lovely in the skein. 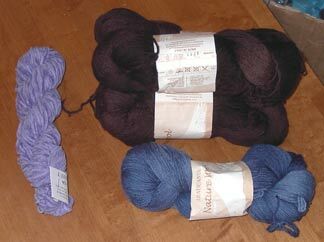 I also got some other goodies too: the Winter SpinOff, some Meilenweit sock yarn and more Kureyon. More on those at a later date. Ring Surf has been a little messed up. They switched over to a completely new system and I don't think it was really complete when they did it. If the ring is wacky or you are trying to get in and haven't, just be patient. I've been spending a lot of time trying to fix things but they aren't processing correctly and I'm having to add people several times before they are actually in the ring. Hopefully things will be running smoothly soon!